On River Tornionjoki year 2014 was historical. Total salmon catches were 147 tons, which is over triple times more than yearly average catch of 21st century (42 tons). About 18 000 salmon were caught in 2014. Heavy salmon run tempted over 10 000 anglers to try their luck on the river last summer. Most of them (86 %) where travelling anglers that came from other parts of Finland. Tourists also got most of the salmon catch (63 %). Last two weeks on June were absolutely the best fishing weeks last year. In July water temperature rised high and salmon did not take easily lures and flies. Two sea-years old salmon – average size of 6 to 8 kilos – formed the majority of the catch. On the Finnish side of the river total catch was 124 tons and on the Swedish side 23 tons. Over half of the anglers who had obtained combined licence of River Tornionjoki, managed to get at least one salmon. Finnish Game and Fisheries Institute, that is now part of the Natural Resources Institute Finland (Luke), estimated together with County Administrative Board of Norrbotten, that total salmon run to River Tornionjoki was over 100 000 specimens last year. Salmon run to rivers of Gulf of Bothnia has increased because of lower fishing pressure and mortality during the sea migration period of salmon on the Baltic Sea. 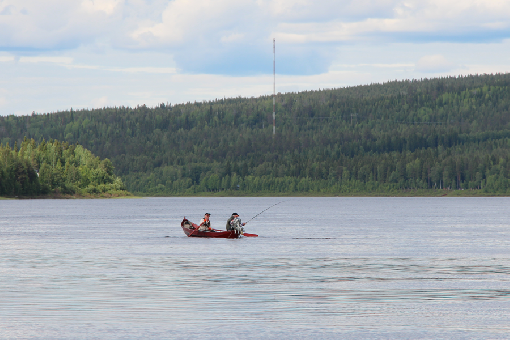 On the top: Salmon is already near the boat on River Tornionjoki in summer 2014. Photo: Ismo Kolari.